Wales forward Tomas Francis admits his rapid rise to international rugby is like "a dream". 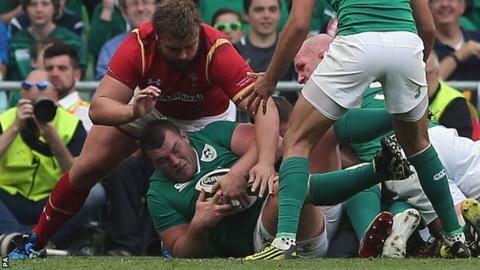 The Exeter Chiefs tight-head prop made his debut in Wales' 16-10 World Cup warm-up win against Ireland in Dublin. "I still have to pinch myself - it's a bit surreal," the York-born 23-year-old said. "Two years ago I couldn't get a game at London Scottish, so to be here now is a dream come true." Francis added: "To come out here and get a win, you can't ask for any more on your first cap." The 20-stone tight-head began his professional career with Doncaster Knights in 2012 before joining London Scottish the following year. Ex-Wales flanker Martyn Williams makes his Wales World Cup squad predictions after the 16-10 win over Ireland in Dublin. That brought Francis to the attention of Exeter, who signed him for the 2014-15 season, where a string of impressive performances and his Welsh ancestry - his grandmother Eirlys is from the Swansea valley - brought him onto Wales' radar. A call-up to the Wales 2015 Six Nations squad followed before Francis was included on their World Cup training camps in Switzerland, Qatar and north Wales. Francis impressed Warren Gatland with "the way he trained and his conditioning", persuading the Wales coach to hand him his first cap at the Aviva Stadium. "I'm happy to get it out of the way, the first game was always going to be the most nervous and the most daunting," Francis said. "I'm quite a nervous character before a game, any game, but once I got into it I enjoyed it. "I was happy with my first scrum but there was one before half-time that got away from us, cost us a try, but on the whole we held it. "I'm glad to get that [first cap] under my belt but obviously a long way from [the level] I want to play - I missed a few tackles and that scrum annoyed me a bit. But a good start. "I always knew the lungs were going to be tested, but I felt the fitness work got me through it and I'll hopefully get some more game time to gain fitness." Now Francis, along with the rest of the Wales squad, faces a nervous wait to see if he will make the cut for the final 31-man World Cup squad, which will be announced at midday on Monday 31 August. "I've just got to wait. I think we're doing it live so no one is getting told before, so it's a nervy day on Monday, wait and watch and hopefully get the call," Francis added. "Obviously I'm hopeful, I'd love to play but there's a lot of competition in my position. "Samson [Lee] is coming back so I'll have to wait and see."